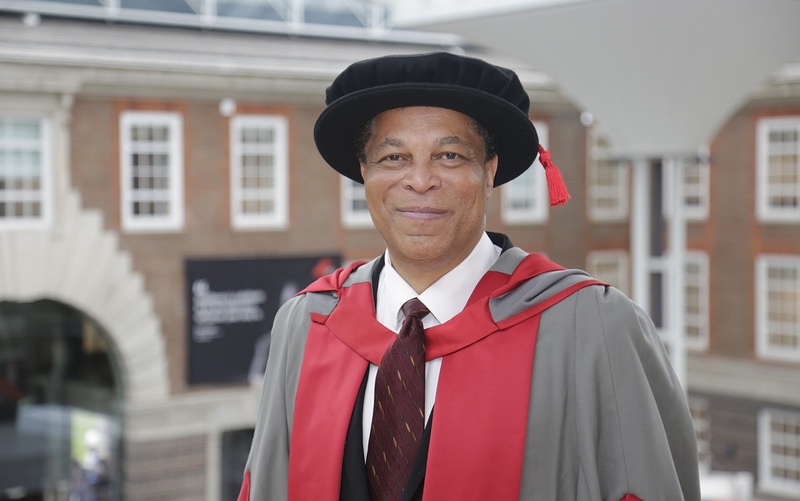 Frank Douglas, an expert in Human Resources (HR) from New York City, has been awarded an honorary degree by Middlesex University London. Frank has been included in the top 30 most influential HR Directors in the UK and his impressive CV explains why. He has led HR for the global technology company Misys, Transport for London and Scottish and Newcastle Plc. He was the first HR Manager to win the BT Chairman’s Awards for championing and delivering a project that saved BT £200 million and he also led the team that was shortlisted by Personnel Today Magazine for one of the best e-learning projects - the BT Internet College. He has addressed senior staff at the Royal Household in Buckingham Palace and also at Stormont and Oxford University. He has sat on the Board of the CIPD as a non-executive for six years. Frank hasn't always worked in human resources though, as a graduate of the ‘Fame’ School (High School of Music and Art) in New York, Frank spent his early career as a semi-professional trumpet player. The honorary degree was very happily received by Frank. "I am both humbled and proud to be receiving an Honorary Doctorate from Middlesex University," he says. "I believe there is no better time to be a human resource professional than now and in the days ahead. I accept this award on behalf of the profession. "Finally, having lived and been raised in social housing in the South Bronx of New York City for the first 15 years of my life, this award reaffirms my belief that your start in life does not have to be your destiny." Frank's honorary degree was presented by Professor Tim Blackman, Vice-Chancellor of Middlesex University. “By awarding an Honorary Degree to outstanding people the University is recognising achievement at the highest level as well as dedication to public duty and making a difference to others’ lives," he said. “Graduation is not only an opportunity to celebrate the wonderful achievements of our graduands but also to look forward to the opportunities that lie ahead because a Middlesex University degree opens up a world of possibilities."